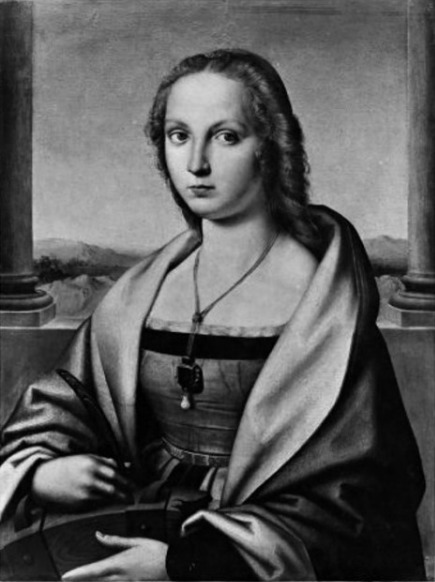 Raphael’s “Lady with a Unicorn” is now on display at the Palace of the Legion of Honor in San Francisco. It was painted c. 1506, when he was about twenty-three. A promising young artist. The title is misleading, suggesting as it does that this is a two-character show. 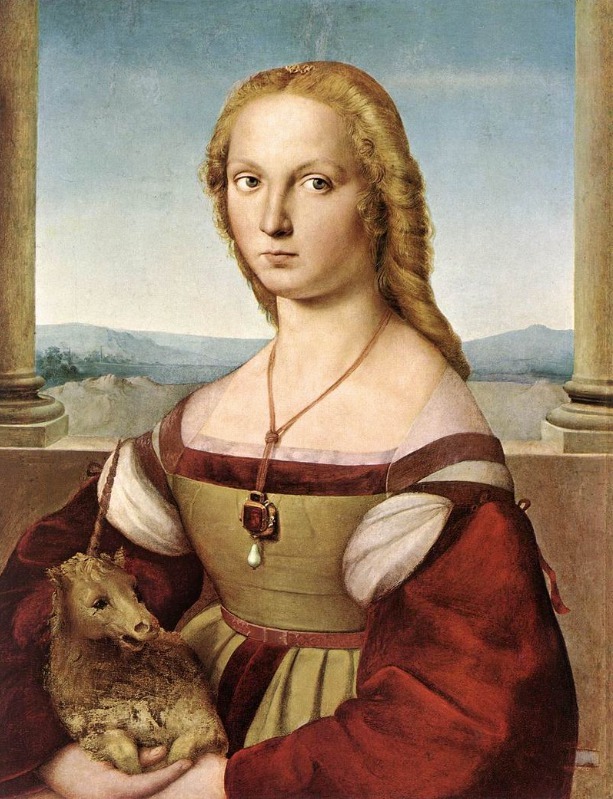 The painting is about the lady, and to that end Raphael deftly subordinates the unicorn. He makes it a small, rather inert shape down in the corner. Its color is very close to her bodice and the wall and pillars behind her: one more tan shape among several. It has no bright lights. It’s intertwined with her hands, which are themselves shown only in part. This avoids any distracting secondary vignette of her caressing it, or it asserting itself. Her right arm, held out a little stiffly, her left arm perpendicular to the right, and another perpendicular down her left forearm, describe a square box containing the unicorn. The effect is to show us the beast but to limit it to its symbolic role, pale and subsidiary. It’s there, but the eye soon passes back up the bright shapes, colors, and contrasts of the lady’s gown and jewels to her face and the surrounding sky. There we linger. The Legion display includes some history pertaining to the painting. At some point it was repainted as an image of St. Catherine. Oh heavy hand! That plastic drapery! You would hope at least that someone felt pretty guilty about it. It was only in the 1930s that the piece was x-rayed, and the alterations, previously suspected, confirmed. The overpainting was then removed with a scalpel. “Lady with a Unicorn” is at The Legion until April 10. There is also a large Pierre Bonnard show, up through May 15. Bonnard was a very irregular artist. Alongside some real killer pieces the show contains a lot of so-so stuff and some real duds. Educational are the reproductions of paintings in the show available in the gift shop, which, with the originals still fresh in the mind’s eye, remind us of the infinite superiority of the real thing.